Where to Buy EcoPCO WP-X, EcoPCO WP-X Water Soluble Pouches - 31 x 0.5 Oz - $37.95 for Sale with Fast Free Shipping! EcoPCO WP-X Water Soluble Pouches - 31 x 0.5 Oz offers quick knockdown and long-lasting residual control that is derived from essential oils and is non-staining, making it an ideal solution for sensitive accounts. PowerPak 20-20-20 Water Soluble Fertilizer..
Zoëcon’s EcoPCO WP-X is a pyrethrin insecticide featuring a Sodium Channel Disrupter mode of action. EcoPCO WP-X is intended to be mixed with water and applied with a handpressurized or power-operated sprayer. EcoPCO WP-X will not stain or cause damage to any painted or varnished surface, plastic, fabric, or other surface when water applied alone causes no damage. Application: For natural pest control in kitchens (commercial and residential), hospitals, supermarkets, and other sensitive application sites, use water soluble pouches as a general surface and crack-and-crevice treatment. 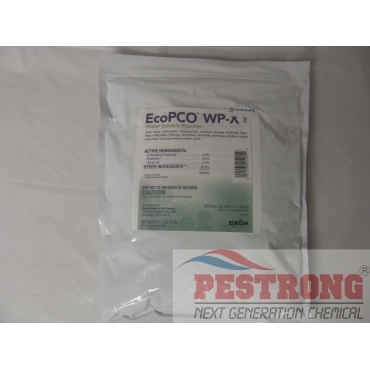 EcoPCO WP-X is a flexible indoor and outdoor reduced-risk pest control formulation. I had some silverfish and spider infestations around my house. Followed the label and administered the perimeter with WP-X. Next day I was surprised to see an unnerving amount of insects, including ants and roaches, dead where I've administered the formula. Definitely will recommend this product to anyone. Pestrong has the best price and fast shipping. Demon wp works GREAT. Always follow the instructions. I am very happy with the product, price , Pestrong shipping and their website works great, thanks. Works very good for household pest problems! Thank you Pestrong for your help! Our new dog started eating fire ant granules, so I tried different liquid sprays to kill the fire ants. Demon killed the mounds using the saturation method within 1/2 hour. Best product yet for fire ants. I purchased after my neighbor told me about it, this works great for all the critters that are usually found around house. I bought a 1gallon sprayer and mixing is easy, I sprayed the perimeter of the house and so far I see dead spiders around the front door and in the garage. I am happy with Demon WP and would recommend it for your own home. I bought this summer. I have never bug problem now. Thanks.